There have been no campus-wide emails, no open meetings, no webpage offering community members a place to give feedback. 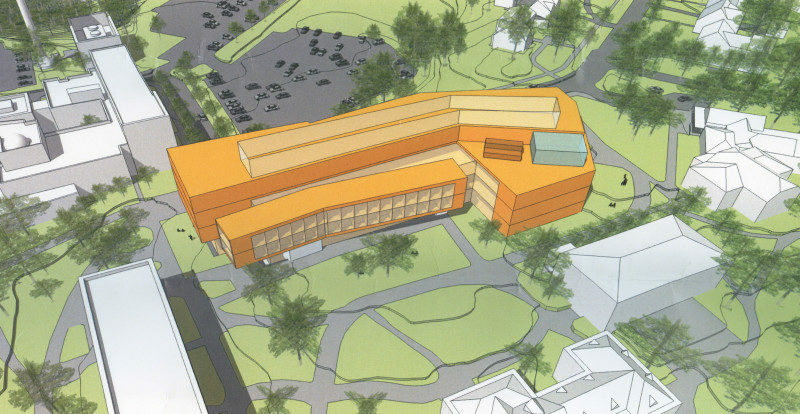 But behind the scenes, Swarthmore has moved rapidly toward a final design for its planned new biology, engineering, and psychology (BEP) facility. A committee has been formed, architects have been selected, and a reportedly final decision has been made to demolish Hicks Hall to make way for the $120 million building. Naturally, according to members of the committee, the project is already seen running over budget. First, major design decisions should not be made in such a secretive manner. If there were reasonable public feedback opportunities in this process, there would be no need to criticize the project at this stage in the pages of the campus newspaper. But since there have been no such opportunities and the clock is ticking, I’d now like to raise the point that if the current plans are carried out, Swarthmore will have made a grave architectural error at a tremendous cost. I should note that this is not the fault of any single person: I know committee members work hard and give the architects valuable input, and that the architects see themselves as giving the committee what it wants. The problem is the architect selection process. As I argued in the Review earlier this year, that process is conducted by committees made up mostly of people who don’t specialize in architecture. The result is inevitably costly architectural mistakes. The firm selected for the BEP project, Philadelphia’s Ballinger, has a frightening track record of mixing glass and brick together into bland boxes with ample room left for a donor’s name to be plastered across the front. They are an easy and deeply conservative choice for a job like this: they’ve designed many science-related buildings for universities without having ever risked a controversial design. For the BEP project, they are proposing a four-story rectangular box on the current site of Hicks and Papazian halls. A double-loaded corridor will run the length of it, offices and labs off either side, with occasional openings to floors below and above. On the southeast side of the building there is to be a lower-level “commons” area open to two floors of offices above. Expect contemporary tedium: an echoey oversize atrium, incessantly bright LED lighting, ample interior glass, a simple and predictable floor plan. Universities all around the country have been building this exact building for more than a decade. The lack of serious thought here is concerning. Architects who seriously use striking angles and sculptural building forms, like Zaha Hadid and Daniel Libeskind, do not simply paste them onto otherwise ill-fitting boxes. Rather, they use them to transform how buildings are experienced and conceived: to suggest movement and disorder in a discipline often characterized by stasis and hierarchy. The easiest—and probably cheapest—solution is to preserve the recently renovated Hicks Hall and build an addition on the Papazian site. I’m no militant preservationist: I just think we shouldn’t tear down a building unless we have good reason to think the replacement will be an improvement. Hicks, which was built in 1919 as the college’s second engineering building and designed by the architects Karcher & Smith (of Clothier Hall fame), already fits the scale of its surroundings. Its blend of Collegiate Gothic and Art Deco forms are a fun counterpoint to the stark simplicity of Trotter. And the large blank panels between the windows offer a great design opportunity for new symbolic facade elements. Like the proposed new building, Hicks is basically a box (albeit a smaller one), so there should not be too much difficulty in reconfiguring the interior. It even already has an elevator shaft. Best of all, its preservation would reduce the need for costly and environmentally wasteful demolition and new material acquisition for the proposed replacement. Preserving the building might make it harder for the project to meet stringent LEED environmental criteria, but it has been widely reported that LEED criteria fail to take into account the environmental benefits of preservation. Economist and University of Pennsylvania lecturer Donovan Rypkema has drawn attention to the specific problem of architects using LEED to justify unnecessary demolition. So: does the college want a medal for being green, or does it really want to preserve the environment? Furthermore, the multi-story atrium should go. Informal gathering spaces are of course fine, but they need not always be so large and exposed. Intimacy and comfort matter too: there’s a reason students value Underhill Library but rarely spend much time in the oversized LPAC atrium. More fun than such big boxes are networks of smaller rooms, with symbolic decoration, sequences of spaces, and surprises—in short, personality. At Jean Nouvel’s Musee du Quai Branly in Paris, for example, different brightly colored forms on the facade correspond to interior rooms rendered in dramatically different architectural styles. But experimenting with styles means playing with symbolic meaning: daring to seriously engage with a campus filled with over a century of contrasting and overlapping architectural meanings. It means being willing to build something that will inspire strong reactions—and that isn’t something Swarthmore tends to do. Meanwhile, the school has already rehired the firm behind the Danawell connector, Jacobs Wyper, for a new academic building near the Lang Center. A rendering has already been released online: it shows a blandly contemporary building of wood and stucco, with plenty of glass and a window pattern that is supposed to read as contemporary. Interested in providing feedback on that? Too bad. Once again no opportunities have been provided. The page on which the rendering is presented is a PR news release, and the message is clear: no discussion needed.